Fairfield, Iowa: Maharishi University Computer Science students were among 10 finalists in a national collegiate hackathon competition to win a trip to Silicon Valley. During their visit they met with high tech leaders from 15 companies. Hackathons are growing in popularity. Companies like Facebook, Google, and now the White House have employed this strategy to come up with innovative software solutions to problems. Last month a company called HackerRank announced a national collegiate computer-programming competition. Over 400 students from the nation’s top schools participated in the hackathon. Contestants were given 24 hours to complete six challenges. Some of the high tech companies sponsoring the competition were Amazon, Facebook, Twitter, and Dropbox. Two students from Maharishi University of Management’s Masters in Computer Science program went up against students from tech titans Carnegie Mellon, Harvard, Princeton, Purdue, MIT, University of California-Berkeley, and both made it into the top ten. Khongor Enkhbold placed 5th and Khasan Bold, 7th. The top ten final positions were: 3 from Berkeley, 2 each from Harvard and MUM, and 1 each from UCLA, Purdue, and Nebraska. All finalists earned an all-expenses-paid trip to Silicon Valley where they met with tech professionals from 15 top companies. They had to sign nondisclosure agreements before entering each company and were not allowed to take any pictures because of work posted on the walls. He noted that almost every company they visited provided many games for their employees to play like PlayStation, Foosball, Ping Pong, Billiards, as well as a lot of free food and drinks. 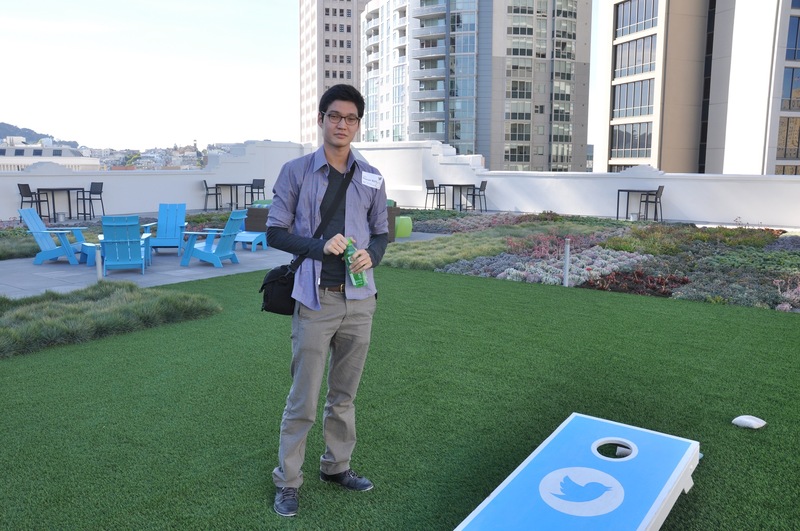 Khasan Bold at Twitter headquarters. Note the logoed lawn game and color-coordinated deck furniture. They also took time to speak with employees at Twitter. Khasan said the trip gave him a “real quick screenshot of the top US IT companies” and hopes it will help him find his future job here in the US. 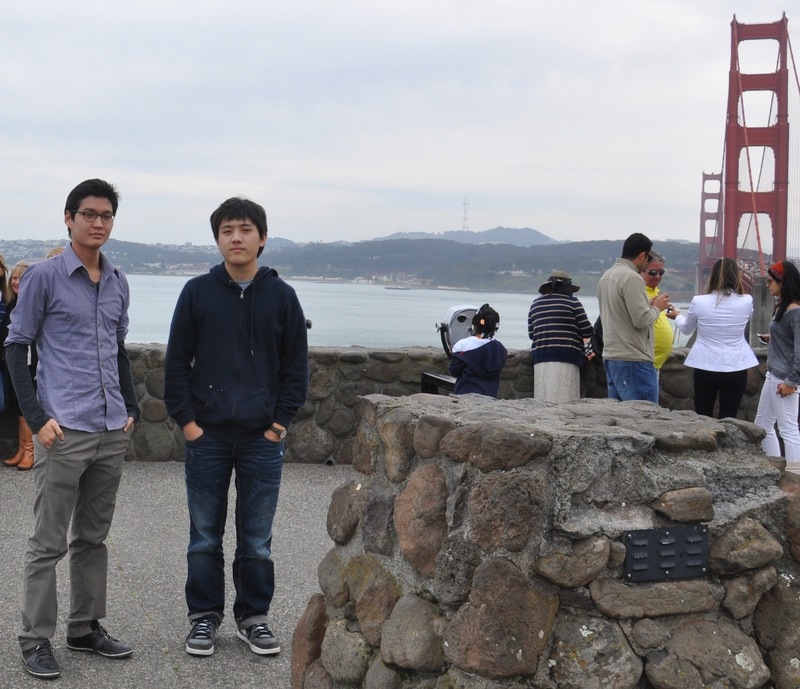 Khasan Bold and Khongor Enkhbold by San Francisco’s Golden Gate Bridge during their trip to Silicon Valley’s high-tech companies. Khasan and Khongor heard about Maharishi University from their friends. They applied to the MS in Computer Science because of the unique opportunity MUM affords its students in gaining practical IT experience with high-level US companies, as well as the cutting-edge curriculum offered by the University’s top faculty. They also found Fairfield, Iowa to be a peaceful, creative city making it an ideal place to study. Founded in 1971, Maharishi University of Management (MUM) is a unique private institution that offers Consciousness-Based℠ Education, a traditional academic curriculum enhanced with self-development programs like the Transcendental Meditation® technique. Students are encouraged to follow a more sustainable routine of study, socializing and rest without the typical college burnout. All aspects of campus life nourish the body and mind, including organic vegetarian meals served fresh daily. Located in Fairfield, Iowa, MUM is accredited by The Higher Learning Commission and offers bachelor’s, master’s, and doctoral degrees in the arts, sciences, humanities, and business. Visitors Weekends are held throughout the year. For more information, call the Admissions Office at 800-369-6480 or visit http://www.mum.edu. PRWeb press release posted March 09, 2013, 9:40 a.m. CST: MUM Computer Science Students Win National Collegiate Hackathon Competition and Trip to Silicon Valley. For more information on Khasan and Khongor, see the Computer Professionals Newsletter announcing their win. See Maharishi University Computer Science Students Continue to Solve Problems and Win Competitions. This entry was posted on March 9, 2013 at 10:07 am and is filed under Articles, Education. You can follow any responses to this entry through the RSS 2.0 feed. You can leave a response, or trackback from your own site.